UMD needs to play 60 minutes in this game, not 50. Also, stay out of the penalty box, even if it means not getting power plays of your own. Yes, I had to go there. This will be a quick blog. I have errands this morning and a hockey practice to run this afternoon. But Friday was so interesting that I couldn't ignore it completely. Not often that you see two ejections in a game, with neither of them being for a hit from behind nor contact to the head. Instead, UMD junior Caleb Herbert was booted late in the first period after being found guilty of spearing Notre Dame center T.J. Tynan in his happy place. Officials used video review to confirm the guilty party on the call. That is within the confines of NCAA video replay protocol, which allows officials to call a penalty and then use video review to confirm the player who committed the infraction. In this case, a linesman made the call, and a referee looked quickly at the video to make sure they had the right player. But the truly bizarre happened in the third period. UMD junior co-captain Adam Krause was checked into the Notre Dame goal crease. On his way out of the crease, Irish goalie Steven Summerhays grabbed Krause by the facemask -- from behind -- and pulled him back. After the ensuing skirmish, the officials convened. They sent Andy Ryan of Notre Dame and a loudly protesting Krause to the box for matching roughing calls (conveniently missing the cross-check that sent Krause flying into the crease to start with). They then ejected Summerhays for facemasking. You read that correctly. A goalie got ejected. Not for fighting or for a hit to the head. No, for facemasking. Freshman Kevin Catunar came in, and he played pretty well. In my opinion, UMD didn't do enough to test the glove of the 6-5 youngster, and his pads cover a lot of space since he's 77 inches tall and everything. But this wasn't a bad effort by UMD at all. I'm sure the Bulldogs would like to get a good chunk of the second period back, and they have to find a way to stay out of the box against these guys. But five on five, UMD proved it can play with one of the best teams in the land. Notre Dame is legit, people. Among the skaters are eight seniors who have seen virtually everything there is to see -- last night proved you never have seen everything. And Jeff Jackson knows he can play those eight seniors in any situation he wants. Tynan (two assists) has a bit of "rat" to him. He's a smart, crafty, two-way player who might be better on the penalty kill than he is offensively. David Gerths, Bryan Rust, Shayne Taker, and many others have talent and loads of experience playing high-end Division I hockey. What am I saying? Notre Dame has everything Notre Dame needs to make it to Philadelphia next April. And it's probably going to take an upset or a rash of injuries to prevent it. That team that has everything got plenty of fits from a young UMD team that needs to grow on the blueline, and it needed some bounces to win 3-2 on Friday. It's a good sign for UMD, no question. The Bulldogs have some very talented pieces of their own. Cal Decowski had a great night, I thought, after Herbert was ejected. Unlike the Tech home game where Dominic Toninato was ejected and it seemed it took the air out of everyone, it seemed that some guys tried to take advantage of the extra ice time available with Herbert out. Decowski and Krause were two examples of that. Andy Welinski struggled early, but got better with the puck in the last 40 minutes, and he threw a couple nice hits in the defensive zone. Freshman Carson Soucy continues to show himself as a heck of a find by the UMD coaching staff, but he had more struggles Friday than he had in the first four games. For now, they have to solve the blue line. Notre Dame did a very good job of putting pressure on the defensemen, and doing so forced too many turnovers by the home team. UMD has to deal with those puck management problems on Saturday to avoid a sweep. I'd expect a little bit of jumbling of personnel, though nothing major with the lines or pairings. Remember, UMD only has 14 forwards and eight eligible defensemen (they have nine rostered, but St. Scholastica transfer Brenden Kotyk can't play this season per NCAA rules). It's a long season, and the guys who sat out last night have to be kept fresh so they're available in case of injury. The NCHC went 2-4 in non-conference play Friday. St. Cloud State (at Colgate) and Denver (vs Niagara) both won, while Colorado College (at Clarkson), Miami (at Providence), Omaha (vs Cornell), and UMD all lost. I ran into Notre Dame's video and other things guru, Nick Siergiej, a former UMD staffer, on my way into the rink. After sharing our complaints about the officiating (of course) so far this season, we agreed that games like this are usually a lot of fun. This job is usually fun, mind you, but these types of games are much more fun. Notre Dame and UMD have produced some quality hockey in the last five meetings, going back to the 2011 Frozen Four. These are two programs that are compatible, as I like to say, and this is a rivalry that should continue. Anyway, on to the opener of this series. Hopefully it isn't a penalty-filled clunker that ends 3-2 with a goal off someone's rear end. There aren't a lot of programs which can boast an out-of-league schedule this difficult. It'll be good for a young Bulldog team. That said, the best of these tests probably comes this weekend, when Notre Dame visits Amsoil Arena. Last week, UMD rebounded from a 3-1 loss to Colorado College to pick up a dominant 5-1 win on Saturday in Colorado Springs. You could see a bit of a turnaround in the Bulldogs' game in the third period Friday, even though it ended up not being enough. "We weren't real happy with that effort (Friday), and that's unacceptable," junior forward Justin Crandall said this week. "We knew what we needed to do Saturday." To be perfectly blunt, UMD kicked the crap out of Colorado College Saturday, in a way I haven't seen a UMD team do to anyone on the road in my eight-plus years doing this. That game was never close in terms of puck possession, scoring chances, or offensive zone time. UMD had 71 shot attempts to 36, 44 shots on goal to 14, and outshot CC 59-20 over the last four periods of the two-game series. "I think it was our best 60 minutes for sure," head coach Scott Sandelin said. "Our guys controlled the play. I thought they played very hungry to win the game." Wins like that are fun, even when followed by 4:30am wakeup calls and 5:30am bus rides through the Colorado mountains. But now the Bulldogs have to follow that strong performance with more of the same. And there will be significant resistance this weekend. Notre Dame is in town for a pair of games starting Friday. The teams have split weekend series the last two years. The Fighting Irish are 4-0 and ranked second in both national polls, having outscored foes 17-5 so far this season. They are eight-for-40 on the power play. Notre Dame has experience up and down its lineup. Its leading scorer through four games is a freshman who plays on the fourth line (in fairness, Vince Hinostroza has seen power play minutes and contributed there). Robbie Russo is one of the best defensemen in the country, and Steven Summerhays has a .946 save percentage through four starts. "They have a lot of seniors," Sandelin said. "There aren't a lot of new faces in their lineup, so they've got a lot of experience." Traditionally, Notre Dame is a pretty difficult team to play against. In addition to Russo, there are big bangers like Shayne Taker and Kevin Lind back there. Sophomore Andy Ryan has shown promise, too. Russo is the key to Notre Dame's lethal power play unit. He quarterbacks the top group, and he loves to have the puck. A big key for UMD will be to deny him good looks and force someone else to carry the load. It's much easier said than done, since Russo will go just about anywhere on the ice to get the puck on his stick. UMD can attack this team with speed, and I'd expect that to be a big advantage for the Bulldogs if they're ultimately successful this weekend. Staying out of the box would be good, too. I'm actually somewhat confident that Notre Dame wouldn't mind some five-on-five hockey after seeing 40 power plays and 24 penalty kills over 240 minutes of hockey. Notre Dame's numbers are gaudy, but the Irish have yet to trail this season. Not even for a second. Maybe UMD can rattle the proverbial cages and get a lead at some point. Again, I'm somewhat confident that Jeff Jackson won't think it's the worst thing to happen if his team falls behind. Over 34 games, it's inevitable. Might as well see how the crew responds. These are UMD's last home games until December, so I'm expecting good and enthusiastic crowds for what should be a very good, fast-paced series. COLORADO SPRINGS, Colo. -- After a rough start and an eventual 3-1 loss to Colorado College Friday, UMD tries to bounce back in the series finale. After this game, UMD is out of conference play and on a bye, so the Bulldogs don't return to NCHC play until Nov. 15-16 at North Dakota. The NCHC home opener isn't until December. And that's it for this year's schedule quirk. Happens to everyone. COLORADO SPRINGS, Colo. -- You know it's a bad night when I leave my laptop cord in the broadcast booth. Wasn't great on the ice, either, as UMD fell 3-1 to Colorado College in front of a sellout crowd at the World Arena. The Bulldogs struggled from the outset Friday, unable to generate consistent offensive zone pressure or get a lot of pucks or bodies to the net. UMD had eight shots in each of the first two periods, but few memorable scoring chances. The third period was better, but UMD entered it down 2-0 and couldn't equalize before a CC power play goal past the halfway mark of the period iced the game. Early in the game, UMD didn't appear to be in any kind of synch. Austin Farley uncharacteristically passed up a couple great shooting chances in favor of ill-advised passes that led to UMD not getting shots at all in those particular sequences. Offensive zone rushes were killed by bad passes or bad puck decisions. These things happen early in the season. Was a bit surprising to see the top line -- Tony Cameranesi, Joe Basaraba, and Austin Farley -- struggle with the puck a bit, since they were together last year. But I'm not at all shocked the second line is struggling with two freshmen and a guy in Caleb Herbert who played center last year. UMD's third and fourth lines were generally non-factors in this game. Justin Crandall had his moments, but this group as a whole didn't get nearly enough offense going and just struggled to get pucks to the net. When it finally did, CC goalie Josh Thorimbert stood his ground nicely, making 14 of his 30 saves in the third period as the Bulldogs surged. It just wasn't enough. The Bulldogs have done pretty well with puck possession, even in this game, where faceoffs were 36-29 the wrong way. That's a big reason I'm not concerned at this point in time. Also, the team played very well in the third period Friday. They got pucks to the net, bodies to the net, and generated some consistent pressure. Were it not for the power play goal (Andy Welinski had to take the penalty he took), those last couple minutes would have been really interesting. Scoring is an issue, but if puck possession isn't a huge issue, scoring will come around. As we saw last Saturday with Tech, if puck possession becomes a problem, it's next to impossible to score. Two games where goalies were great against UMD isn't anything meaningful. If it keeps up, we could have an issue. But the fact that UMD isn't chasing the puck up and down the rink is a good thing. It's tougher to turn around puck possession issues than it is to turn around scoring issues. Coaches like to talk about "bearing down" in front of the net. UMD has to do that. Pucks are there to be banged into the net. It's simply a matter of someone taking advantage of the opportunities. There is zero reason for panic at this point. For that reason, I don't expect huge lineup changes Saturday. UMD might tweak the bottom two lines to try to get a spark, and you might see a change on defense or in goal, where Aaron Crandall hasn't played yet. That isn't a shot at Matt McNeely, but it might benefit the sophomore to watch a game right now after playing three in a row. A .923 save percentage through three games is impressive, so I don't think that's the problem. But don't look for much more change than that. Now watch UMD throw the players' numbers into a hat and re-draw everything. North Dakota won the first game in NCHC history, beating Miami 4-2. Four different players scored for UND, and goalie Zane Gothberg made 35 saves on 37 shots for the win. North Dakota led 3-0 in the second before the RedHawks scored twice in the middle stanza. Nick Mattson's goal with seven-plus minutes to play iced it for UND. Nebraska Omaha won non-conference at Northern Michigan, 2-1. Ryan Walters and Brock Montpetit lit the lamp for the Mavericks, with Montpetit's third period tally proving to be the game-winner. Kirk Thompson stopped 28 of 29 Wildcat shots for UNO, which improved to 2-1. At the Brice Alaska Goal Rush, Western Michigan broke its season-long shutout streak early and routed Alaska Anchorage 6-2. Shane Berschbach scored twice for the Broncos, while Josh Pitt had a goal and an assist. Frank Slubowski got the win in goal. Also, Denver blew a 2-0 lead in a 3-2 overtime loss to host Alaska. Cody Kunyk tied the game in the third for the Nanooks, then Garrick Perry scored in the final 30 seconds of overtime to win it. Denver had held opponents scoreless for the first 159 minutes and change this season before UAF scored in the last minute of the second period Friday to get on the board. Opponents flip-flop Saturday, with Denver battling UAA and Western Michigan playing Alaska. Also, the Minnesota women scored three in the third to pull away from UMD 4-0 at Amsoil Arena. The Gophers have now won 54 games in a row. COLORADO SPRINGS, Colo. -- The Penrose Cup is here. For display, I'm guessing. Seems a bit too early for someone to be able to clinch the league title. This first NCHC season kicks off in style, as UMD takes on Colorado College in the back end of a CBS Sports Network (221 on DirecTV, not sure about others). 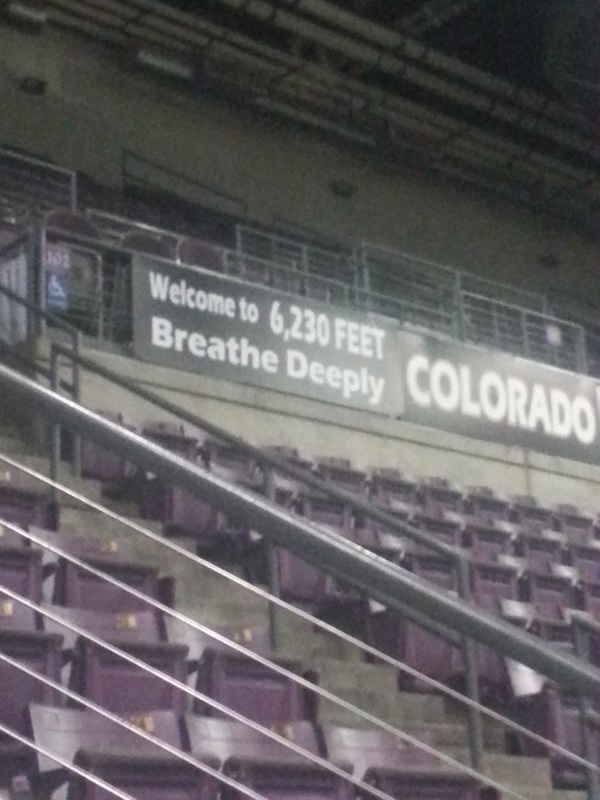 COLORADO SPRINGS, Colo. -- When you go to Magness Arena, the visiting team -- be it for basketball or hockey -- is greeted with one of those goofy signs that welcomes you to whatever the elevation there is (5,280-some odd feet). The tunnel at the World Arena in Colorado Springs doesn't have such a sign. Instead, two signs like the one I snapped a picture of at the rink Thursday adorn the inside of the facility. These aren't there for the fans. The fans aren't exerting enough energy to have to worry about altitude. They also aren't there for the broadcasters, though there was this one time the elevator there was on the fritz and I had to haul my fat body up all those stairs. And then I was worried a bit about the altitude. The altitude reminders are out there. Home teams love to remind visitors about it, and the media loves to use it as a talking point whenever there's a significant game out here. Longtime UMD strength and conditioning coach and current marketing guru Justin May never believed in it. He believed in the conditioning of his athletes, and didn't think there was a whole lot to the altitude talk as long as the athletes took care of themselves. Coaches don't want to even let someone suggest it could matter in a game. That's excuse chatter, and coaches hate that. Not only that, but it's part of the mental game. If you go into a game thinking your body is going to break down because of altitude, it probably will. Athletes are wired the same way. "Obviously, being reminded of that, it's in your mind," sophomore center Tony Cameranesi said this week when asked about the visual notes of elevation in the Colorado arenas. "But for the most part, as long as you work hard and don't really think about it, it goes away a little bit." And if you look at the records UMD has posted both in Denver and Colorado Springs, there's reason to believe that the altitude talk is nothing but that ... talk. In its last 18 games at the Colorado Springs World Arena (since the start of the 2003-04 season), where UMD opens NCHC play against Colorado Springs Friday night, the record is 9-6-3. Included in that are some very impressive performances, including a two-game WCHA playoff series sweep that started the team's run to a Final Five championship in 2009. Over the same stretch, the Tigers are 140-72-13 on home ice, a winning percentage of .651, a much higher total than the .417 they've posted against UMD in the same building. Up Interstate 25, the Bulldogs have been solid, though not as impressive, in Denver over the years. Since the start of the 2003-04 season, UMD is 8-8-1 against the Pioneers at Magness Arena. I guarantee you DU has won more than half its home games in the last decade. Don't even have to look it up. My point? UMD hasn't cared about the altitude in the last decade, at least (UMD was 1-7 in its first eight games at the World Arena once it opened in 1998). I'm not saying you shouldn't, but it's humorously overrated. Maybe in football, where the 300-pounders are running around, it matters a bit more. We all know what thin air can do to a baseball. But the Bulldogs aren't suffering when they play out there. Quite the opposite, actually. In other matters, it is a historic night on Friday, as conference games are played in the National Collegiate Hockey Conference for the first time. Everyone seems to have been able to poke their fun at the "Super League" after Omaha lost to Bentley last week. They must have forgotten about Michigan losing to a Canadian college team (Waterloo) the previous weekend, and the No. 1 team in the nation (UMass-Lowell) losing its home opener to a Sacred Heart squad that won exactly two games a year ago, and one that got pasted by RPI 6-0 the next night. The NCHC is going to be a very, very good league. Other things will work themselves out. No, the app isn't perfect yet. But at least there is one, and they'll work to make it better. I mentioned on Twitter last week that in-progress scores on the league website need to show what period the game is in, and how much time is left. The league responded and said it will try to make it better. I know this thing has been in the works for a while, but it doesn't mean every kink will be ironed out before games are played. What matters is that when those imperfections rear their ugly heads, someone actually makes an effort to improve. In that way, I really like the responses I've seen from the league to certain questions and concerns. I do believe the league made a mistake in not setting up a streamlined video streaming package, where everyone goes through the same service, and games can be easily found on the league website with little hassle. A UMD fan should be able to watch every UMD game played (in league play, that is) without buying access from a bunch of different schools. Hopefully, it's something that is looked at in the future. It's next to impossible to predict how this league will play out, and even opening weekend is going to be fun. Colorado College hasn't played a game that counts yet, and while UMD has, I tend to think UMD will average more than three goals per weekend. In Oxford, Miami hosts North Dakota in a battle of programs who have gone without a national championship since UND won in 2000, no matter what the fans want you to believe (Miami has never won one, though it's certainly been close a couple times). They're tremendous programs, however, and this weekend should be some fantastic hockey. More than anything, that's what we should be focused on. I think those expecting these teams to go unbeaten through conference play, and for the league to have everything instantly figured out, are barking up the wrong tree. In the end, the hockey will win out, and NCHC hockey is going to be good. It's hard to get a good read on this weekend series. I think the style of play will be completely different from what we saw with Michigan Tech last week. Colorado College wants to get out and skate, and so does UMD. More than anything, the good mesh of playing styles is why UMD has done so well against the Tigers. CC has Alex Krushelnyski, one of the nation's most underrated players, leading the charge up front, along with Archie Skalbeck and promising young talent like sophomore forward Hunter Fejes. The Tigers are not as deep in the back, unless Wild draft pick Gustav Olafsson develops quickly. And the loss of Joe Howe in goal could be significant unless senior Josh Thorimbert reverts to his third team All-WCHA form from his sophomore season. UMD will get a chance to push the pace with its lethal top two forward lines, and I think we'll see a lot more from the second line than we did last week, when Dominic Toninato, Alex Iafallo, and Caleb Herbert struggled to get room against the Huskies. Finally, congratulations to future UMD Bulldogs Neal Pionk and Karson Kuhlman. Both have been named to Team USA for the World Junior A Challenge next month in Nova Scotia. Pionk is a defenseman from Hermantown, and Kuhlman is a forward from Cloquet/Esko/Carlton.